An orator, or oratist, is a public speaker, especially one who is eloquent or skilled. Christianity is a religion based on the life and teachings of Jesus of Nazareth, as described in the New Testament. Its adherents, known as Christians, believe that Jesus Christ is the Son of God and savior of all people, whose coming as the Messiah was prophesied in the Old Testament. Depending on the specific denomination of Christianity, practices may include baptism, Eucharist, prayer, confession, confirmation, burial rites, marriage rites and the religious education of children. Most denominations have ordained clergy and hold regular group worship services. Kannaki Amman is the deified form of Kannagi, the heroine of the great Tamil epic Silapathikaram, worshipped mainly in Sri Lanka and Kerala. As the goddess of chastity, rain and fertilization, she is well praised by the Malayalis and the two main ethnicities of Sri Lanka, the Sri Lankan Tamil Saivites and also by the Sinhala Buddhists as Pattini Deviyo. The Palk Strait is a strait between the Tamil Nadu state of India and the Mannar district of the Northern Province of the island nation of Sri Lanka. It connects the Bay of Bengal in the northeast with Palk Bay in the southwest. The strait is 53 to 82 kilometres wide. Several rivers flow into it, including the Vaigai River of Tamil Nadu. The strait is named after Robert Palk, who was a governor of Madras (1755–1763) during the Company Raj period. Tamil literature refers to the literature in the Tamil language. Tamil literature has a rich and long literary tradition spanning more than two thousand years. The oldest extant works show signs of maturity indicating an even longer period of evolution. Contributors to the Tamil literature are mainly from Tamil people from South India, including the land now comprising Tamil Nadu, Kerala, Sri Lankan Tamils from Sri Lanka, and from Tamil diaspora. The history of Tamil literature follows the history of Tamil Nadu, closely following the social, political and cultural trends of various periods. The early Sangam literature, starting from the period of 2nd century BCE, contain anthologies of various poets dealing with many aspects of life, including love, war, social values and religion. This was followed by the early epics and moral literature, authored by Hindu, Jain and Buddhist authors, lasting up to the 5th century CE. From the 6th to 12th century CE, the Tamil devotional poems written by Nayanmars and Alvars, heralded the great Bhakti movement which later engulfed the entire Indian subcontinent. It is during this era that some of the grandest of Tamil literary classics like Kambaramayanam and Periya Puranam were authored and many poets were patronized by the imperial Chola and Pandya empires. The later medieval period saw many assorted minor literary works and also contributions by a few Muslim and European authors. Much of Tamil grammar is extensively described in the oldest available grammar book for Tamil, the Tolkāppiyam. Modern Tamil writing is largely based on the 13th century grammar Naṉṉūl which restated and clarified the rules of the Tolkāppiyam, with some modifications. 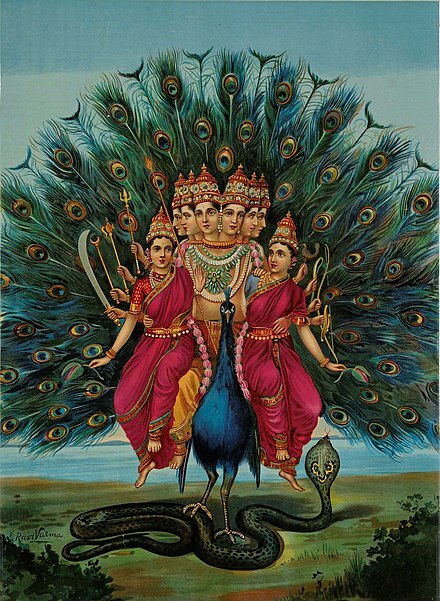 Murugan with his two wives. Arumuka Navalar published the Tirumurukarrupatai , a devotional poem dedicated to Murugan. ↑ Holt, John (2011-04-13). The Sri Lanka Reader: History, Culture, Politics. Duke University Press. p. 460. ISBN 0822349825. ↑ Sugirtharajah, R. S. (2005-06-16). The Bible and Empire: Postcolonial Explorations. Cambridge University Press. ISBN 9780521824934. ↑ Pillay, Kolappa Pillay Kanakasabhapathi (1969). A Social History of the Tamils. University of Madras. ↑ Social Science Review. Social Scientists Association. 1979. p. 61. 1 2 Jones & Hudson 1992 , pp. 27. ↑ Prof. D. Dennis Hudson (1939–2007) was a Professor of World Religions at the Department of Religion, Smith College at SUNY. He taught religious history of India and South Asian religious literature in translation. His research interests focused on the Tamil speaking peoples of South Asia from their earliest appearance to the present, with special attention to two period: the 8th–9th-centuries period of Alvar and Nayanar and the 18th–19th-centuries period of interaction between Christians, Hindus, and Muslims, notably between the Protestants and Hindus. His detailed study of Arumuka Navalar is an attempt at understanding the Tamil Hindu reaction to an intrusive Protestant worldview in the 18–19th century period. ↑ Balachandran, P.K. (24 June 2006). "Cutting edge of Hindu revivalism in Jaffna". Daily News. Lake House Publishing. Archived from the original on 21 October 2012. Retrieved 20 September 2011. ↑ "Saiva revivalist Arumuga Navalar remembered on 181st birthday". Tamilnet . Retrieved 20 September 2011. Ambalavanar, Devadarshan Niranjan (2006). "Arumuga Navalar and the construction of a Caiva public in colonial Jaffna (Sri Lanka, India)". Harvard University. Retrieved 20 September 2011. Rajesh (2003). "Research Theme: Mapping the processes of transmission, recovery and reception of classical Tamil literature in late 19th and early 20th century colonial Madras Presidency" (PDF). Insititute Francais de Pondicherry (Department of Indology). Archived from the original (.pdf) on 17 July 2007. Retrieved 18 October 2007. Young, Richard; Jebanesan, S (1995). 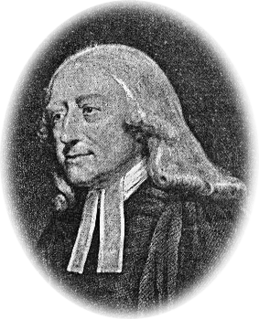 The Bible trembled : the Hindu-Christian controversies of nineteenth-century Ceylon. Vienna Inst. für Indologie. ISBN 3-900271-27-5. Hinduism has a long tradition and which is the oldest religion in Sri Lanka. More than 2000 years civilization have proved so far from Hindu temples in Sri Lanka. 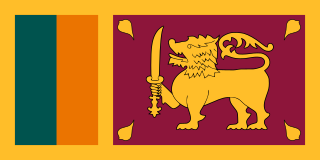 Hindus currently make up 12.60% of the Sri Lankan population, and are almost exclusively Tamils apart from small immigrant communities from India and Pakistan such as the Sindhis, Telugus and Malayalees. In the 1915 census they made up almost 25% of the population, which included the indentured labourers the British had brought. Due to emigration, today they are still a sizeable minority. Hinduism is dominant in the North and Eastern provinces, where there are predominantly Tamil people. Hinduism is also practised in the central regions as well as in the capital, Colombo. According to the government census of 2011, there are 2,554,606 Hindus in Sri Lanka constituting 12.6% of the country's population. During the Sri Lankan Civil War, many Tamils fled to other countries. 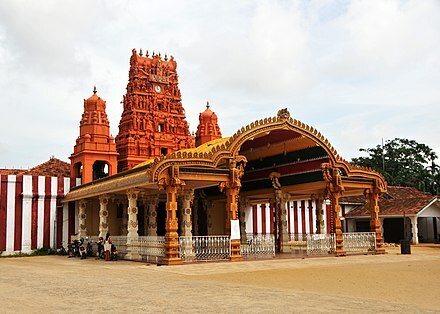 There are Hindu temples abroad which were built by the Sri Lankan Tamil diaspora to maintain their religion, tradition and culture. Ketheeswaram temple is an ancient Hindu temple in Mannar, Northern Province Sri Lanka. Overlooking the ancient period Tamil port towns of Manthai and Kudiramalai, the temple has lay in ruins, been restored, renovated and enlarged by various royals and devotees throughout its history. Tirukkētīsvaram is one of the Pancha Ishwarams dedicated to the Hindu deity Shiva and is venerated by Shaivas throughout the continent. Throughout its history, the temple has been administered and frequented by Sri Lankan Hindu Tamils. Its famous tank, the Palavi tank, is of ancient antiquity and was restored from the ruins. Tirukkētīsvaram is one of the 275 Paadal Petra Sthalams of Shiva glorified in the poems of the Tevaram. Village deities are a common feature of the Hindu pantheon of deities. They are known as Gramadevatas. Each Hindu region and caste of India and South Asia has its share of village deities. Sri Lankan Tamils venerate their own group of village deities throughout Sri Lanka, specifically in the Tamil-dominated north and east of the island nation. Swami Vipulananda, also known as Vipulananda Adigal, was a Sri Lankan Tamil Hindu social reformer, literary critic, author, poet, teacher and ascetic from the Eastern Province of Sri Lanka. Vipulanada was an early pioneer associated with the Indian-based Ramakrishna Mission in Sri Lanka. Along with other reformers, Vipulanada was instrumental in the revival of the Hindu religion and native traditions in Sri Lanka after a long period of dormancy and decline during the previous 500 years of colonial rule by various European powers. Viswanather Casipillai was a Crown Proctor and co-founder of the Jaffna Hindu College. S. Kanapathipillai was a minority Sri Lankan Tamil literary figure and Hindu revivalist in the school of Arumuga Navalar. His father was Sinnathamby Pillai of Madduvil in Chavakachcheri. Kanapathipillai was enrolled at the Navalar Kaaviya Paadasalai, under Kumaraswamy Pulavar, where he pursued higher studies in classical Tamil and literature. He was also guided by Swami Vipulananda, while still a student at the Navalar Kaaviya Paadasalai. The introduction and early development of printing in South India is attributed to missionary propaganda and the endeavours of the British East India Company. Among the pioneers in this arena, maximum attention is claimed by the Jesuit missionaries, followed by the Protestant Fathers and Hindu Pandits. Once the immigrants realized the importance of the local language, they began to disseminate their religious teachings through that medium, in effect ushering in the vernacular print culture in India. The first Tamil booklet was printed in 1554 in Lisbon - Cartilha em lingoa Tamul e Portugues in Romanized Tamil script by Vincente de Nazareth, Jorge Carvalho and Thoma da Cruz, all from the Paravar community of Tuticorin. it is also the first non-European language to find space in the modern printing culture in the world. The first Bible to be Translated in India The history of Bible translations into the Tamil language commences with the arrival of Bartholomäus Ziegenbalg at Tranquebar in 1706.